Heating, ventilation, and air conditioning (HVAC) systems act like magnets for a very wide variety of airborne contaminants that have the potential to affect you and your family’s health. Some of these airborne contaminates are fungi, mold, bacteria, dust, hair, flakes of human skin and pet dander. Removing these contaminates from the air your breath should be considered a major component in maintaining a healthy household. The picture above is not normal. 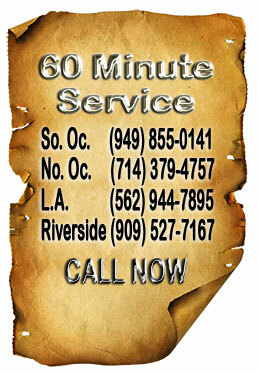 This duct is much dirtier than the average ducts that we clean on a daily basis here in Orange, Riverside and Los Angeles Counties. 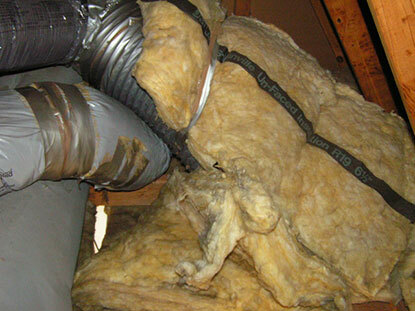 This picture above is a typically example of broken air ducts in an attic. Improper repairs were made that not only allowed heat from the attic to enter the home, but also the contaminates from the attic to enter the home. This included termite poison, pollen, dirt and the reason we were called out. Rat droppings in the ducting. Can a Carpet Cleaning Company Clean Air Ducts? No, they should never be hired to clean your air ducts. The picture of the rusted ducting on the right is an example of the kind of work that is performed by unqualified air duct cleaners pretending to clean your ducts. 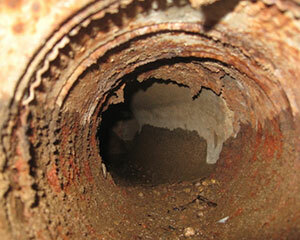 This picture is of a duct cleaning on a system that was cleaned every year for the past 5 years. 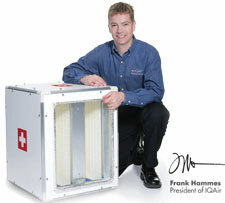 The pretend air duct cleaners certified “Clean ducts” without ever really performing significant work. Of course not. Just showing up to your home costs more than that. The companies that are advertising ridiculously low prices for home air duct cleaning are merely bait and switch rip off companies. They are counting on homeowners that are gullible. Don't be gullible. 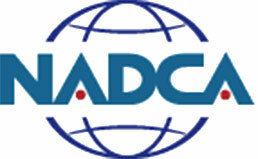 Use a licensed contractor, not a carpet cleaner. Would you use a gardener to fix your roof? 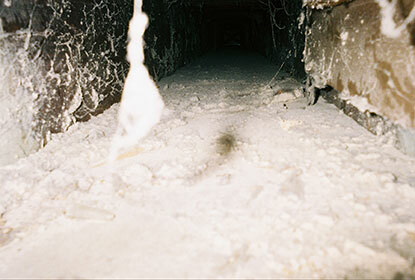 The frozen furnace to the left was frozen because of a lack of airflow through the ducting caused by an undersized and improperly installed return air duct. Duct cleaning, they paid for it before calling us out, did them no good whatsoever. They were careful to put tarps down and they did a great job of cleaning up afterwards. Angie's List Is Duct Cleaning Worth It? 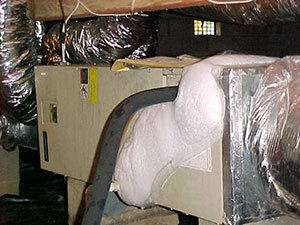 If you need to clean your home air ducts you have a problem that a typical air duct cleaner cannot resolve for you. Do yourself, your family and your health a favor and give us a call for a free in home evaluation of your heating and cooling system. 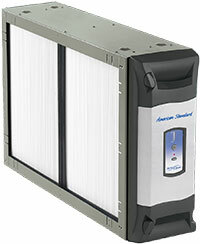 We can give you the options to turn your indoor air quality into something you want to breathe.